2.19 an account of the importance of nectary guides to the foraging bee using a named example and describe how the following flowers, having been successfully pollinated, can indicate to bees that their visits are no longer required – clover, forget-me-not, horse chestnut. The Module 2 exam is next Saturday November 8th, and I’m afraid I’m well behind on revising. However, I’ve decided not to give myself a hard time about that. The exam is just for “fun”, and if I don’t pass it’s not a big deal – I’ll still have learnt something. And I can retake in March. How pollination works is something that interests me. Perhaps you have seen bees fly around a plant ignoring some flowers and landing on others, seemingly randomly. But it is not random! They are picking up on all sorts of messages which we often either can’t perceive or don’t know how to interpret – perhaps a pheromone scent, an electrical charge or ‘nectar guide’ patterns on the flower petals. 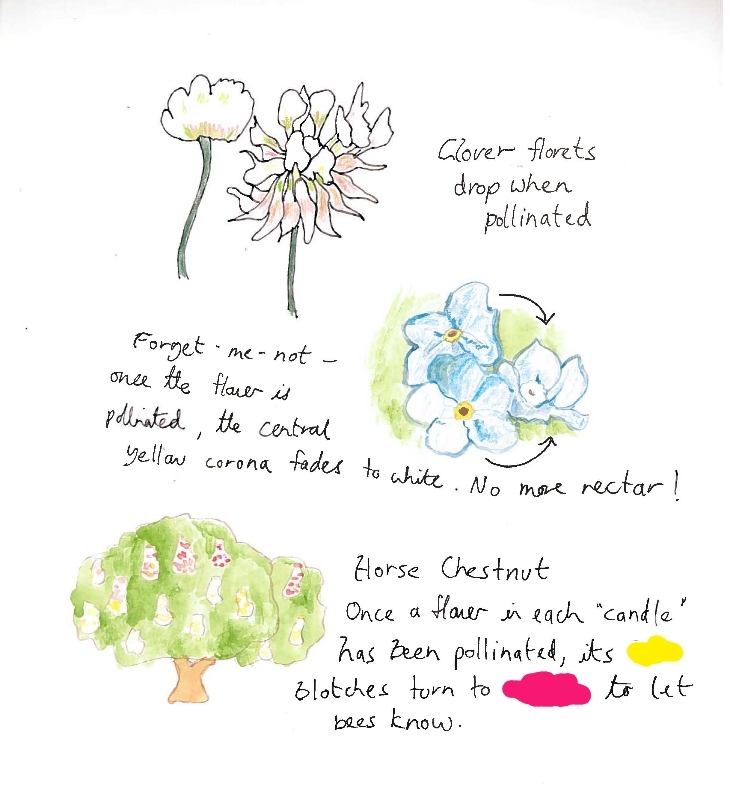 Below is a drawing I did illustrating some of the physical changes clover, forget-me-not and horse chestnut flowers use to show pollinators that they have already been pollinated and therefore are no longer providing nectar and pollen. It is in the interest of plants to help pollinators do their job efficiently, so that they can concentrate on visiting un-pollinated flowers. Both forget-me-not and horse chestnut use yellow to attract the bees initially when their flowers are un-pollinated and excreting nectar. When the forget-me-not’s yellow bulls-eye corona fades to white, this highlights the central nectaries less. Although a red/pink magenta tone may seem like a more eye catching colour for the horse chestnut flower to change to, actually bees are red colour-blind, so red appears rather dull to them. Additionally the horse chestnut flower’s colour change is accompanied by a change in scent that is perceived by bees, so that they can distinguish between younger and older flowers. 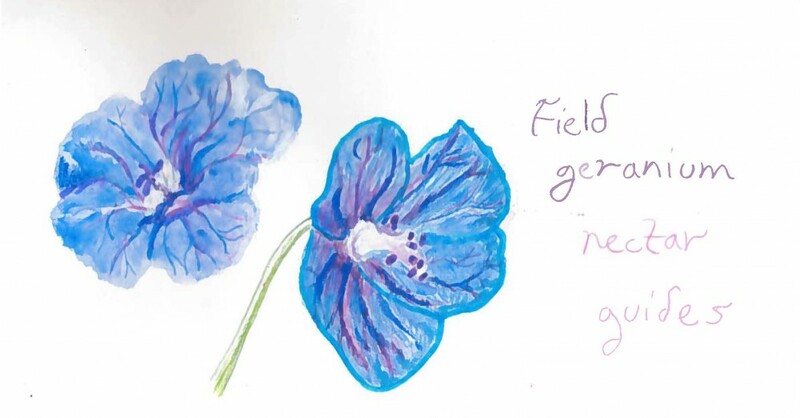 My lurid attempt at drawing a field geranium’s nectar guides is below. The lines of the nectar guides on the petals draw attention to the flower’s nectaries at its centre, like arrows pointing the way. The field geranium flowers between July to September and is a good nectar source for bees. Many nectar guide patterns are not visible to the human eye but can be seen by bees, as they can perceive UV light. So for instance a bee sees some dandelions as having a purple outer ring and a central disc of yellow. This is because the outer florets of the dandelion strongly reflect UV light. However, the UV markings can vary between different micro species of dandelion, for instance the dandelion photographed in Bjørn Rørslett’s brilliant UV flower catalogue has a red centre and pale blue outer ring: Dandelion under UV light. Bees can see other things we can’t too – like the electrical field surrounding a flower. Scientists have found that bumblebees can sense the electric field that surrounds a flower and use this information to work out whether a flower has been recently visited by other bees. If it has, it’s likely to be low on nectar. Read about this on the National Geographic website: Bees can sense the electric fields of flowers – and here’s the original study: Detection and Learning of Floral Electric Fields by Bumblebees. I’m sure there are many things we have yet to learn about how bees and flowers interact. This entry was posted in Exams, Foraging and tagged Module 2. Bookmark the permalink. I guess I always half-wondered why the centres of flowers were different colours – especially forget-me-nots. Thank you! I hadn’t really noticed that the centres were different, so you are more observant than me. I have watched bees working forget me nots and seen the colour change and assumed it was because the pollen had been removed. Interesting about the dandelions. I was told by a botanist, over 30 years ago, that dandelions aren’t pollinated but self-fertilise by a process called cell migration, so all the dandelions close to each other in a patch will be clones, having identical leaf patterns etc, but dandelions from a few miles away may be slightly different through mutation. If you look at dandelion pollen under a microscope it doesn’t have the regular, almost geometric, shape that other pollens do but is ‘messy’ and it was suggested the reason is that it no longer functions as other pollens do and is a left over from earlier stages in the development of the species. Bees, of course, still gather it but it performs no function for the plant, making the pollen a truly altruistic gift! Interesting, thanks Chris. Perhaps dandelions haven’t evolved out of offering pollen yet but will do eventually. Thanks! We’ll see… the trouble is I have very little to zero practical experience of using bee products for wax making and mead etc, which is a big part of the exam syllabus. Good luck with the exam. Your diagrams are both beautiful and very informative, a rare combination. Thank you Philip, that’s really kind of you. Really interesting post, Emily. Makes perfect sense, but I had no idea that flowers would change depending on their supply of nectar, what a concept. Good luck with the studying and upcoming exam. Thanks Erik. I hadn’t really known either, or thought about it – it’s all part of the hidden world of bees which most of us are unaware of. Thanks Amelia, I’ll be watching the flowers now too! Lovely diagrams! You are multi-talented! Good luck with your exams on Saturday.